Are you looking for fresh ideas to improve your Twitter marketing? We sought out hot Twitter tips from the pros. Keep reading for inspiration. Now’s not the time to let your Twitter marketing go stale. Twitter has already grown more in the last 9 months than in the last 5 years and this trend is expected to continue. How does Twitter fit into your social media marketing? 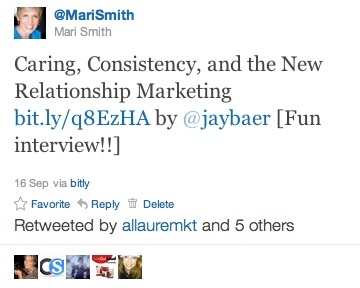 Here are 17 Twitter marketing tips shared by Social Media Examiner’s writers. Do your best to craft your content tweets, @replies and promotional tweets all with a seamless style that matches your personality and/or brand. Ideally, you want people to read your tweets and feel naturally compelled to click on your links and retweet you. You just want to add value and have no agenda or attachment to “making the sale,” yet you’re strategic and mindful about how you tweet. Then you’ll see a marked improvement in your retweet and click-through rates. A content tweet from Mari with a link to an informative blog post, and an upbeat comment in square brackets. Mari Smith, co-author of Facebook Marketing: An Hour a Day. Keywords have been and continue to be a relevant and driving force for web content (whether we’re talking about a website, blog post, Facebook update or a tweet). Keywords are the backbone of content. So I’d have to say hands-down, my best Twitter marketing tip for business is to make a list of keywords that best describe your business and industry. Use these words as you compose your 140-character posts. Think quality over quantity. Make every character and tweet count! Debbie Hemley, social media consultant and blogger. Sharing links to useful content is, statistically speaking, more effective at growing and retaining followers than “engaging” with them in conversation. That’s not to say that conversations aren’t useful in helping people to like you, but if you want to grow your fan base, you need to share more links than you do @replies. Shane Snow, co-founder of Contently.com. Use the search feature in a Twitter tool like HootSuite to watch for conversations about a problem your business can solve. It will give you insight into what is on your prospects’ minds and provide an open door for you to help them. Try providing a link to a great article or video that answers their question. This one action could lead to an ongoing dialogue that in turn may lead to a customer relationship later. Nichole Kelly, publisher of FullFrontalROI.com. There are two crucial things businesses should focus on when implementing their Twitter strategy. The first is not finding just anyone to follow in hopes that they follow you back, but finding relevant people to follow who are more likely to follow you back. You can bloat your account to 100,000+ followers, but if they are not interested in your content, it gets you nowhere. You need to be using tools such as Follower Wonk, Twellow and Wefollow to find people who are in your region (if you’re a local business) and interested in your industry. Then start following them. The second is after you find your targeted audience, don’t just tweet at them—tweet with them. Follow their conversations; add in your two cents from time to time. Follow anyone who talks about your brand and thank them for their compliments or help them with their concerns. Follow anyone who talks about your industry and show why you are an authority. Doing these things will help you run a successful Twitter campaign that will give your brand exposure as a leader in your industry! Kristi Hines, Internet marketing specialist with Vertical Measures and author of Kikolani. Most followers become nameless, faceless numbers on a follower list. Remember when networking used to be about meeting people face to face? Icebreakers were important then, and they’re just as important now in the virtual world. Icebreakers help you share a common connection with a stranger—and make you memorable enough to begin and sustain a long-term relationship. When you find relevant tweets from among your followers, retweet their blog link—and follow the author’s feed. Then send them an @message, detailing something insightful about their blog post. At the end of the tweet, link to a similar post you’ve written. This should result in more blog comments, retweets and followers, all from 10 minutes of effort. Twitter is all about icebreakers, and collecting followers who instantly recognize you in a sea of faces. Invest time in your introductions and they’ll make all the difference to your feed. Carla Dewing, content marketing expert and part-owner of Contrast Media. Pay attention when someone tweets about your blog posts or retweets something you’ve shared. When you are building a business, never take it for granted when people help you spread the word. Start by thanking them for the tweet. And take it a step further: add them to a private list for tweeters and retweeters. At least once every day for five minutes, review the tweets in that list. Look for great content that you might have missed, information from smart people you need to follow and conversation trends you might have missed. Jump into conversations, retweet items your community would appreciate and thank people for sharing great things. But most of all, get to know more about these people who volunteered to become part of your team by sharing your content. It’s all about relationships, and Twitter helps you build relationships with these important members of your community. Charlene Kingston, founder of Social Media DIY Workshop. Find ways to reach out and engage your audience. Too many businesses want to just set their Twitter feed on autopilot or constantly push promotional content. Although there is a place for the promotional tweet, your feed will receive much more attention if you make it a resource for your followers. Sharing articles of interest, leading discussions on topics important to your industry, answering questions and sometimes just being there can do this. It’s about creating relationships and building trust in those relationships. Although they may not be clients now, when the time comes, you’ve already cleared the first hurdle for your followers. Jim Lodico, copywriter and marketing consultant. Plenty of people are filling up Twitter streams with the tech-equivalent of screaming infomercials to buy things. Effective marketing on Twitter takes time. But it also takes more than just selling or pushing your message. Engaging and interacting with your consumers in a consistent and helpful way will keep your product or service at top of mind. Not everyone needs your offering right now. You want to provide information and solutions that keep them reading, so when they need what you have, they know you’re there for them. Sara Hawkins, lawyer and blogger. If you mess up, admit it. If you don’t know the answer to a question, admit it. If you’re inexperienced, admit it. If you’re willing to admit that your business is not perfect and is a work-in-progress or open to suggestion, your audience is more likely to take you seriously. You build your company’s credibility and trustworthiness. The quickest way to lose credibility? If, as a business, you attempt to cover-up, lie or over-promise and under-deliver. Be honest, be real and be transparent. Stephanie Gehman, marketing manager for Harrisburg International Airport in Pennsylvania. You can reward your followers when they participate by retweeting them or displaying their tweets on your site or blog. Bergdorf Goodman is a high-end clothing and shoe retailer that is using the Instagram photo app as well as a Twitter hashtag (#BGShoes) to encourage fans to tweet pictures of their shoes (purchased at BG of course) around the city of New York. 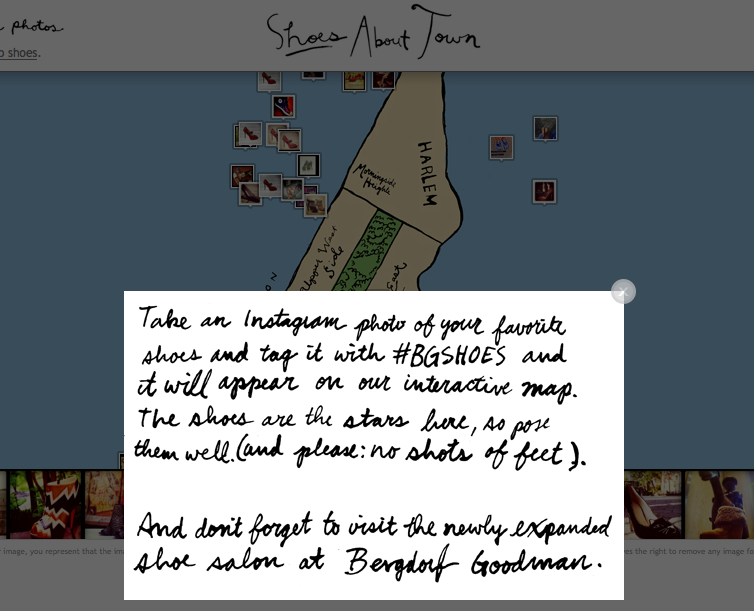 Bergdorf Goodman is capturing all of the photos and tweets on this interactive map, which gives users an incentive to participate. Here’s another example, the San Francisco Food Bank (@SFFoodBank) gave followers a challenge: Try to spend less than $5/day on food. And tweet about it along the way, using the #hungerchallenge hashtag. 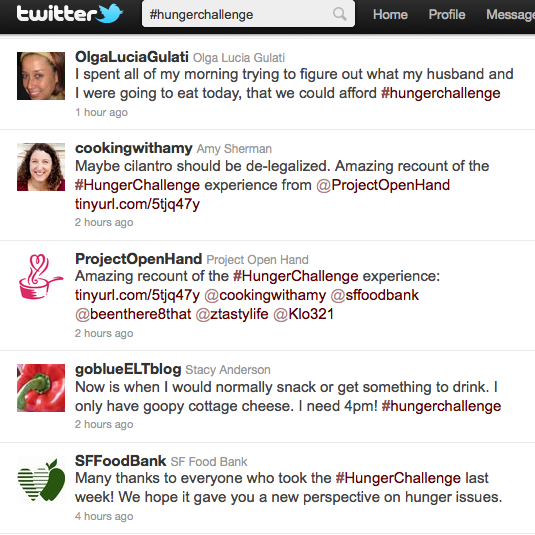 Participants are listed on the Hunger Challenge website (and you can pity them in real time as they tweet about their barely full bellies, all captured in the hashtag stream: https://twitter.com/#!/search/hungerchallenge). Food blogger @CarinaOst is one of the participants able to help increase awareness of hunger in SF and promote the Food Bank. These tweets were not just blank advertisements; they were an entertaining journal of the struggle of trying to eat on a budget each day! Tim Ware, owner of HyperArts Web Design. One of the best ways to do this is to encourage visits to your blog or website by providing something of value for free in exchange for email addresses. (Make sure what you’re giving them is extra-juicy and useful!) That way, you have permission to keep in touch and build an ongoing relationship with prospects. This shouldn’t be thought of as list-building just for the sake of boosting your subscriber numbers; rather, it’s a natural continuation of the solid foundation you’ve begun building with a potential client or customer within the Twitterverse. Christine Gallagher, relationship marketing speaker, trainer and coach. When you’re thinking about using social media for lead generation, you want to use Twitter as not only a conversation channel, but also as a way to drive traffic to your content. I found a significant increase in traffic from Twitter and engagement with our account when I posted several tweets of a blog post rather than one the morning. It gives your followers a chance to catch that link if they missed it the first time and also targets people in different time zones. Don’t be spammy and go overboard, but sharing your content several times (if it’s valuable) will give you the extra edge. Janet Aronica, Inbound Marketing Manager at HubSpot. Syncing your LinkedIn account with your Twitter account can make your Twitter activities much more relevant to business. Not only can you share content across both networks simultaneously, but also you can keep track of your professional connections from LinkedIn and follow their tweets! Make sure to add your Twitter account to your LinkedIn profile. Visitors to your profile will be able to follow you on Twitter right there from your profile page! Have more than one Twitter account (perhaps personal and business)? Add them both to your LinkedIn profile and designate your primary account. Install the LinkedIn “Tweets” application on your LinkedIn profile and immediately go through and follow each of your LinkedIn connections who have Twitter profiles. In most cases, your professional connections are going to follow you back! Create a Twitter list of your LinkedIn connections automatically with the click of a button using the Twitter application in LinkedIn. This makes it easy to follow the stream of updates on Twitter coming from your professional connections. Twitter is a firehose of information, data and resources. I’m a big fan of making sense out of that data and making it more relevant to your professional network! Integrating your Twitter account with LinkedIn is a great way to do this. To learn more, catch this article from Social Media Examiner: How to Use LinkedIn With Twitter for Better Networking! Stephanie Sammons, founder and CEO of Wired Advisor. Sending out 140-character messages every so often may not seem like a task that requires marketing automation software but, to the contrary, these tools can greatly improve the effectiveness of your Twitter marketing. There are a slew of services available, some free and some paid, to help manage your Twitter account. At Strutta, we use the HootSuite dashboard to track Twitter activity, which can be easily categorized into multiple streams that we follow. We also use Summify to help filter through the noise and surface news that is most relevant to our industry. This enables us to find content that is both useful to consume and valuable to share with our followers via retweeting. Sharing relevant content from other trusted sources helps establish your credibility, especially when mixed with your own original content. 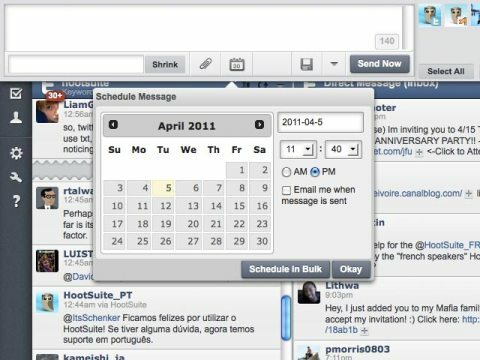 When it comes to sharing, having a platform like HootSuite where you can schedule tweets is extremely helpful. Given the short shelf-life of a tweet, you can easily schedule content to be pushed out at pre-set intervals to maximize visibility. Ben Pickering, CEO of Strutta. 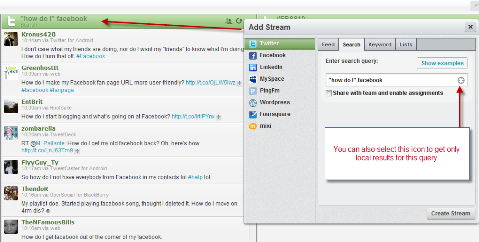 I have a separate tab in HootSuite set up only for searches that I want to monitor throughout the day. I have several columns of searches on this tab so I can see in one glance what people are talking about with respect to those searches at any given moment. I use a combination of searching on hashtags and searching on just keywords. In this screenshot, I show one search I have with the hashtag #Facebook. Then I also have a search where I put the words “how do I” which will give me an exact match on that phrase, and the word “Facebook” which will show both of those key phrases anywhere within the tweet. I’m looking for people asking questions about Facebook that I can help with. I can then answer the person’s question and perhaps follow them. When you help people who have questions about your niche on Twitter, you stand out as a leader and authority in your field. Make sure you are authentically helping people out and not giving a sales pitch. So if you want to watch for people asking questions about your niche—which is yoga, for example—you would put the keywords “how do I” and “yoga.” Or you may find that a better search question could be “where do I.” Test out different keyword phrases to see what works best for your business. Andrea Vahl, co-author of Facebook Marketing All-in-One for Dummies and Facebook community manager for Social Media Examiner. I was at a conference last week where a professor who specializes in new and emerging media made this confession—he frequently asks his students to teach him how to use Twitter, Facebook, LinkedIn and other social media tools. The truth is, if you’re like most businesspeople, it’s very hard to keep up with all of the changes taking place. One way to get more efficient about using Twitter and other tools is to sit down with someone younger than you and ask him or her for a front-lines tutorial. Oh sure, we all understand the CONCEPT of Twitter, but when it comes to the practical application or the unwritten rules, it’s hard to keep up. The solution, I’ve found, is to not be shy about asking someone younger for a brief, in-the-trenches tutorial. In the long run, it’ll save you hours and hours of anguish. Jamie Turner, co-author of How to Make Money with Social Media. What do you think? What’s your favorite Twitter marketing tip? What works best for your business? Please share your comments in the box below.